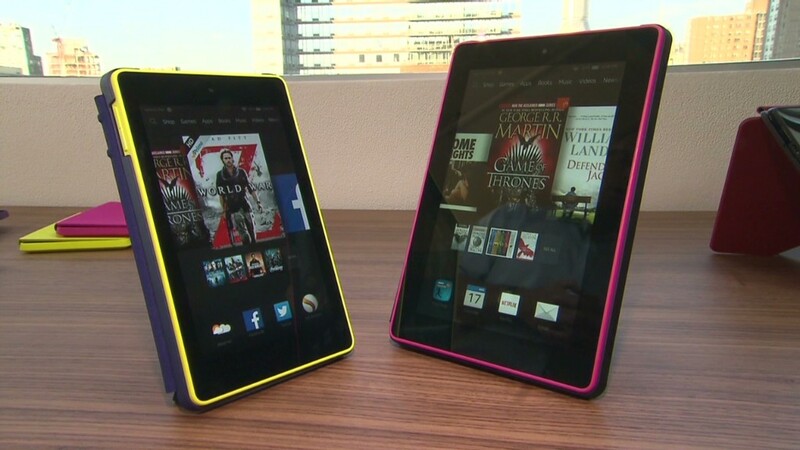 Amazon has released a new set of tablets and e-readers. A $79 Kindle and the Kindle Voyage are the company's new e-reader offerings. "This is our thinnest, highest resolution, highest contrast e-reader we've ever done," Amazon VP Peter Larsen said of the Kindle Voyage, which starts at $199. "We have a long term-vision to replace paper," Senior Vice President of Devices David Limp said at the launch event in New York Wednesday. That translates to e-readers with higher resolution and contrast display. By releasing a cheaper e-reader, Amazon (AMZN) hopes to tap into markets like India and China. The company also unveiled new Fire tablets, including one aimed at children. Their Fire HD Kids Edition comes with a two-year "worry-free" warranty. The tablet is equipped with Amazon FreeTime, a feature that lets parents manage what their children can access. Other new tablets include the 6-inch Fire HD, a tablet the company is touting as "the most powerful tablet under $100" and a $140 7-inch Fire HD tablet. To prove the durability of Amazon's Fire HD tablets,Larsen said the company puts the tablets through the ringer, blasting everything from salt water to sunscreen on them and placing them inside a tumbler, which simulates the inside of a purse or backpack. Executives also introduced the Fire HDX, showing off new audio features. As part of the demo, executives said the tablet was 20% lighter than the Apple's (AAPL) iPad Air, and had a million more pixels. All devices are available online for pre-order and will begin shopping in October.